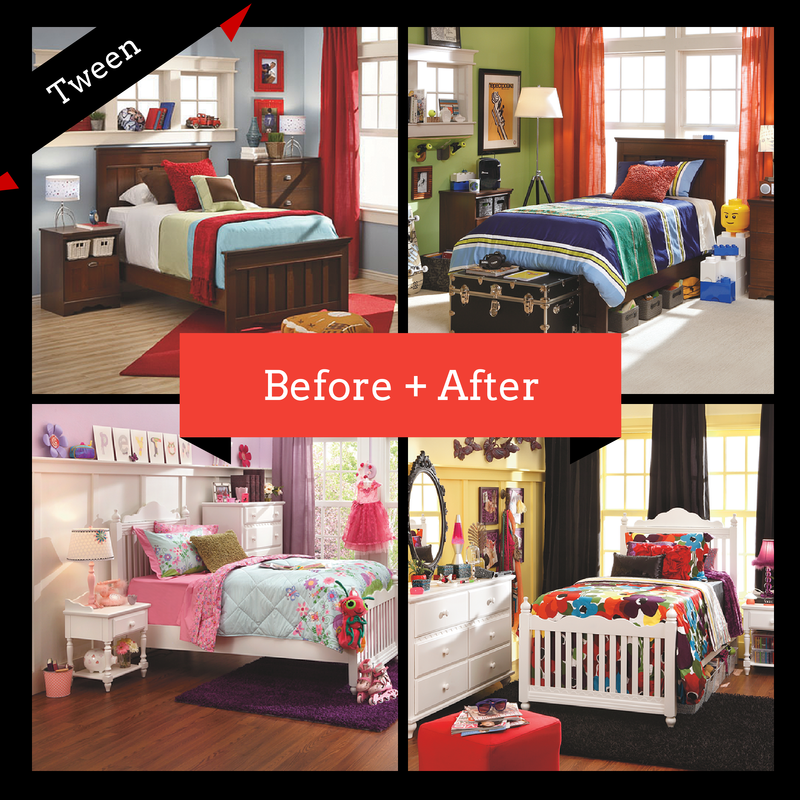 Two rooms take on a grown-up makeover as they transition from kid to tween friendly decor. As your kids move into their tween years, they want a space of their own to express their individual style and interests. And, since your tween has most likely outgrown the race car bed or My Little Pony wallpaper of their childhood, chances are they’re looking to assert their independence through making updates to their bedroom design. Bedroom Expressions has everything for your child’s changing bedroom and bedroom style. To help your tween remodeling project go smoothly and result in a room they’ll love well into their teen years, it’s a good idea to plan the remodel together with your child. First, sketch out his desired layout and create a list of must-have (but reasonable) features. It’s best to keep expensive items like flooring and furniture basic, and then incorporate your tween’s desired theme into less expensive items and accessories like colorful paint, bedding and wall art. Although tween boys are still active and playful, they don’t want to be perceived as childish. So a good option for his room could be incorporating colors from a favorite sports team, or if he’s into music, this theme can easily translate into his teenage years. Go bold or go home. A bedroom is a great place for your tween to express his individual style. By using a hobby he’s into — like this skateboard — as a design element, you can create a unique space that he’ll love. Add vibrant colors to the mix, and you can give the room an easy and inexpensive makeover. As your child moves into his teen years, primping and preening can begin to be part of his morning ritual. Updating a dresser to one that includes a mirror will give him the space he needs to prepare for the day (and keep him out of your bathroom)! For girls, it’s also important to design a room that she’ll continue to love as she enters her teens. It’s best to stay away from movie and pop-specific themes, which are trends that come and go quickly. Most likely, she’ll want to distance herself from childish décor and gravitate toward hip designs, so consider choosing removable wall decals that come in about every color and shape imaginable, or mixing up patterns in her comforter, sheets and pillows for an eye-catching splash. Lighten up. By keeping white furniture, you can give the room a bright and airy feel — offering the perfect contrast to the dark drapes and rug. This furniture choice also makes it easy if your tween chooses to swap paint colors or bedding later. Bright accessories and wall colors allow your child to personalize her room to match her style. For more Before and After, follow us on Pinterest.